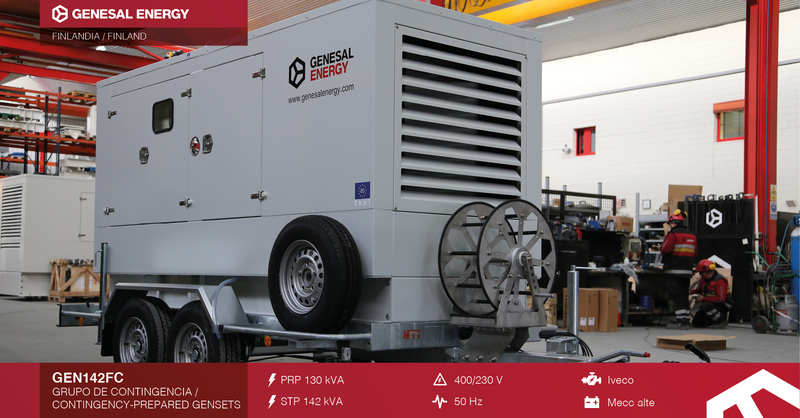 The close relationship we have with our distributors has lead us to supply a 130/142 kVA trailer-mounted genset, with weight limitations and prepared to be moved around in unfavourable meterological conditions. Mobile unit, mounted on a road-approved trailer, with M+S tires. Compliance with emission standards for mobile gensets. 250 litre fuel tank integrated into the base frame, specially designed to not excede the requested weight limits. Cable drum to accommodate 15 metres of rubber cable of the H07RN-F 5G35 type located on the trailer’s tow bar. Manual 4 pole breaker, with LS/I protection and minimum voltage coil. 125 A external socket, with differential and thermal protection. Power outlet busbar with access from the outside. Average sound level of 74 dB(A) at 7 metres.